Surf Town Breakdown: Breakdancers--with some help from Tom Noddy's performers' code--show off their stuff in downtown Santa Cruz. Musicians, downtown residents and councilmembers are stewing in the aftermath of last week's marimba incident, in which local band Sadza was asked by the SCPD to stop playing on Pacific Avenue (Nüz, June 27). Musician Rick Walker is organizing a coalition to address what he feels is "a stepping-up [of efforts] by police to stop live music in this town." Though the marimba contingent could barely get a word in edgewise during the June 26 Santa Cruz City Council meeting's public-comment period, they did manage to get their point across: that live music is a boon to Santa Cruz and ought to be encouraged, not routed. And then there is Michele Makel, who lives and works at El Centro on Pacific Avenue. She's also starting a new coalition, called (probably) the Pacific Avenue Residents Association, to represent downtown residents concerned with noisy disturbances in all forms, not just musical ones. "Why not have Pacific Avenue closed to automobiles? Not all the time, just Friday and Saturday evening," says Makel, adding that musical disturbances are also a big problem for Pacific Avenue residents, most of whom are retired. "It seems like most of the residents' complaints [about music] go unaddressed," she says. "When you register a complaint with the police, you can request a call back, but a lot of people don't do that and go back to sleep, so the complaint goes unanswered." Councilmember Emily Reilly says, "It's important to spend time going over what is currently on the books regarding music ordinances downtown. There seems to be a little confusion on this point, but we're optimistic we can put something together that will work for most people and be very supportive of musicians downtown." Councilmember Ed Porter thinks "we need to take a look at how we're doing it [dealing with downtown music]. Having police shut down the marimba band was not a good move. We need to look at how the policy is being developed and implemented. A few things may have happened that are not appropriate." 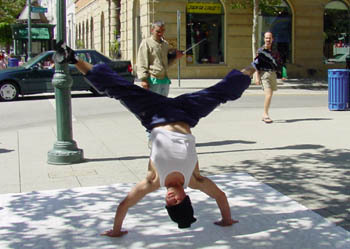 Porter believes that "the street performers' self-adopted agreements are the best way to go." He's referring to agreements compiled in 1980 with the consensus of 35 street performers, who were trying to avoid inflexible laws when a conservative City Council threatened a ban on their craft. As Tom Noddy, bubble man and organizer of the Santa Cruz Street Performer's Guild, explains, "The agreement consists of the unwritten rules of street performing, which is older than stores if you think about it. Street performing goes all the way back to the markets of Babylonia." Noddy says that over the years, the approach has garnered inquiries from towns with similar problems as far away as Tyler, Texas. The rules, copies of which are given to performers, residents, police and downtown hosts, call for an hourly rotation, no blocking of pedestrian traffic, and self-regulated spacing to prevent too many performers from accumulating in one area. Performers are also asked to respect downtown residents by observing the city's noise ordinance, which calls for a 10pm curfew on noisy behavior. As Noddy points out, one of the first street performers in Santa Cruz, Tom Scribner--the saw player immortalized in bronze on Pacific Avenue--lived at the St. George Hotel and used to yell at musicians if they woke him up. "The RP is more concerned with money than news," claims Lloyd-Rogers, who was let go on May 22. Because her firing occured a few days within her three-month probation period, it wasn't necessary for higher-ups to tell her why she was losing her job. However, according to Lloyd-Rogers, editor Jon Chown did let slip that it had something to do with her "overinvolvement" with her work. "That's when I knew," Lloyd-Rogers told Nüz, recalling how, two days before she was fired, the RP ran a Lloyd-Rogers story titled "Flaws creep out on Clean-Up Day," about biannual cleanup efforts in Pajaro. "Sometimes the cure causes new illness," the story began. While showing the benefits of cleanup day, Lloyd-Rogers' story also gave voice to several small mom-and-pop businesses located next door to an abandoned gas station where cleanup day's dumpsters are stored. According to Lloyd-Rogers' story, these businesses have long complained about the increase in rodents during cleanup time. Leonides Quintero of Leo's Market and Carniceria told Lloyd-Rogers that because the rats got into his products, he lost between $300 and $1,000 during every cleanup. When Quintero notified the Health Department, he was cited for having rats on the premises. So, Quintero took his problems to the owners of Young's Tire Service, across the street and one block down from the dumpsters. Lloyd-Rogers wrote that owner Diane Young, "the driving force behind the cleanup," was "less than sympathetic" with Leo's plight and "told him to get rat traps, castigated him for not coming to the planning meetings for the cleanup and said he needed to figure out where the dumpsters should go." Young, an advertiser with the RP, has a reputation as someone who makes her presence felt. Young told Nüz she did indeed call the paper after the story came out, because "there were many errors in the article." "She called my husband by the wrong name," Young said. "And she misspelled a supervisor's name. She also came into my business at 4:30pm without an appointment or a phone call. I was concerned with the quality of the article. She didn't recheck her facts, she misquoted a deputy and incorrectly hyphenated 'cleanup day.' There were eight or nine different things like that. And I felt very strongly that it was inappropriate for her to come in here without an appointment and bring one of the other people in the article with her." Two weeks after Lloyd-Rogers was canned, the paper ran a story called "Grassroots group gaining ground in community improvement effort," which touted Diane and husband, Pete Young, for their work with the neighborhood committee Together in Pajaro. The 900-word "atta girl" article chronicled the group's many accomplishments over the last 10 years, from raising money for Christmas decorations for street lights to providing uniforms for the middle school. The Youngs were quoted extensively and exclusively, save for a short line praising cleanup day from the same deputy that Lloyd-Rogers allegedly misquoted. Lloyd-Rogers is now freelancing for local papers. The RP did not return Nüz's calls. From the July 4-11, 2001 issue of Metro Santa Cruz.